There is an abundance of charts for kids all over the internet, and it can get overwhelming for a mom to choose the ones that suit her needs best. I've noticed the charts that work best for children are simple and have the least amount of frills. When I use charts for my kids, I see significant progress, and my kids are more productive. A responsibility chart can help a mom get her child to complete tasks with less nagging. When your child sees what he is expected to do each day in a clear and straightforward manner, he's more likely to accomplish his tasks. One of the biggest excuses children use when asking them to do a chore is, "I forgot." So if you're tired of hearing that excuse, eliminate it by using an efficient system. It's important to teach a child that good things come from making an effort. Setting tasks and having your child accomplish them, will teach her a necessary life lesson. She'll learn that she has to work towards a goal and that rewards have to be earned. If your child is old enough to read and write, you can assist him with filling his chart with duties that he must accomplish daily. When he learns to play an independent role in his life, he will act more responsibly and discover the art of organization. Tailor tasks according to your child's age level so he can easily understand the expectations. Younger children can start jobs as young as three years old, and older children can do a lot more than we think. Searching for age appropriate chores online will give you ideas, as well as taking into affect the maturity level and responsible nature of your child. Remember that when you assign tasks to your child, it is a learning process. She may not be capable of accomplishing the task as good as you. A young child may not know how to clean or tidy a room, so it is important to show her and be realistic in your expectations. Focus on judging the effort according to age and ability. For charts to be effective, it has to be posted where it's easy for kids to see and access when they need a reminder. Some good places to post charts are the refrigerator door, a kitchen or family room wall, a bulletin board in the hallway, your child’s bedroom, or a home binder. Some mothers see chores as being part of a family where each child is expected to pitch in. Other moms feel that a child needs more motivation to get the task done well. Both are true, but why not use what you already have to motivate your child. For example, if your child plays on a tablet, allow her to use it only after she accomplishes her tasks for that day. Alternatively, you can set aside additional rewards for chores and tasks completed. Set aside a specific time each week to review the accomplishments of your child's progress. You can make it feel like a big deal with some extra hugs and kisses when your child does well. If he shows a lack of effort, ask him to brainstorm how he can do better and give him some motivation. Also, ensure that your incentives are the kind that are worth earning. To make it easy for mothers (as I know it can be a daunting), I've created a variety of different sets of children's charts in three color schemes. These are charts that I have used with my kids and have worked extremely well for us alhumdulillah. A motivational chart set is divided into morning, afternoon and evening duties to differentiate tasks throughout the day. I've added some motivation and made it easy to follow for any child. 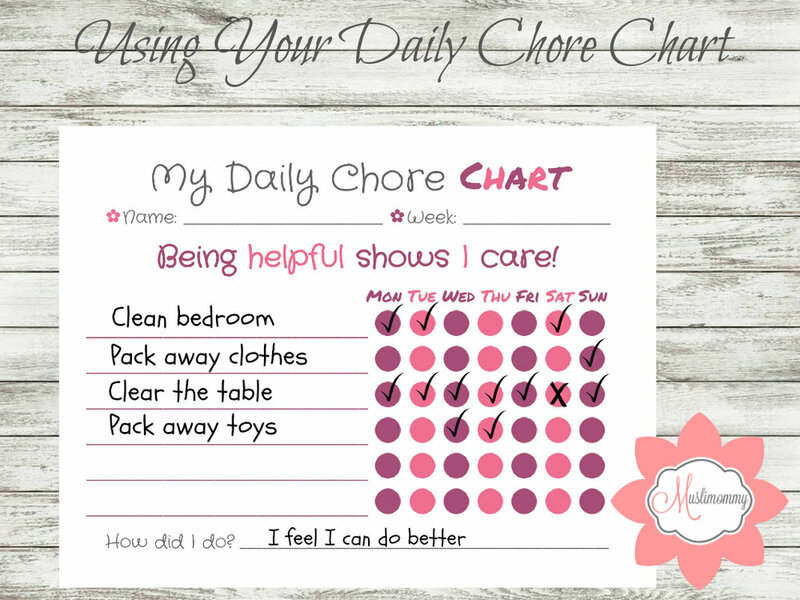 Chore charts will help a child to keep up with her chores. It can be personal tasks like, cleaning her room, packing her toys away, putting away clothes, etc. It can also be for chores she can assist you with around the house such as setting the table, clearing the table, emptying the dishwasher, tidying the family room, etc. You can mix personal and home chores to keep it simple. Your child gets to tick her chores when she is done with them each day. At the end of the week, she gets to rate her progress and sees proof of her initiative and whether she earns privileges or not. Fill the Daily Salah Chart with your child and place it near the prayer area in your home. Your child can tick his chart each time he performs a salah. This is a good way to reward him for praying on his own or with the family. It will assist you in helping your child to instill the habit of prayer inshAllah. Let him rate himself at the end of the week to see which salah needs improvement. You could offer your child a treat for encouragement if he makes a certain number of salah for the week. I've created different sets of responsibility charts for chores, personal care, reading, behavior, and even good deeds. I've also created sets of Islamic charts for areas in which your child may need the motivation to make salah, learn Arabic or Nuraniyah, and reciting or memorizing The Holy Quran. These charts are fantastic for parents, teachers, and homeschoolers. Find them in the Muslimommy Shop. Tip: You can print these charts on both sides to save on copy paper. You can also laminate the charts and use it with a dry erase marker if you prefer to print it once and use it over again. Give it a try! Start your kids on responsibility charts and see how much you can change your day from "talk, talk, nag, nag" to "see-it-get-done!"